So after being in business for six years reviewing various sites and hundreds of feedback we decided to make the ultimate plan at ultimate cheap prices, compared to other seedbox companies we are quite new but we are passionate about seedboxes and what yo could do to make the best out of your seedbox investment. We have a great live support which is online 24X7 and we do have a great sense of humor so hit us up even if you are felling a bit down 😛 but the plans we have got are for sure going to put a smile on your face. 1. We have the best french servers with speed test listed on out website. 2. We have clearly mentioned the number of people per server so you know what you are getting rest assured your experience will be quite smooth , with almost no lag. 3. We have live support most of the time and if you need some help we provide help on skype as well, we really care about our customers and we are our customer support.If you are new to seedboxes feel free to ask any question at our support , we would be happy to help. Sometimes we sleep so rest assured you will get a response the first thing we wake up. 4. All major plugins come pre-installed so you can be rest assured. 5. We decided on the space to be 400 Gb because if you trying to build some decent ratio with less space its an uphill battle , also less user per server mean you will have a much better experience. 6.We have paypal payment as of now , you can also use your debit/credit card with paypal checkout , we are working on a bitcoing payment gateway and it should be available soon as well and we would definitely not give out your details why? because we want to stay in business. 7. We keep the prices low by cutting costs on our end and not compromising on the quality, we want you to stay with us. 8. We provide custom plan just shoot us your requirement and we will get back to you with the best price. 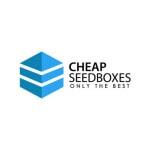 You can visit or site here, If you are looking for more options you can refer to our top list Seedbox.